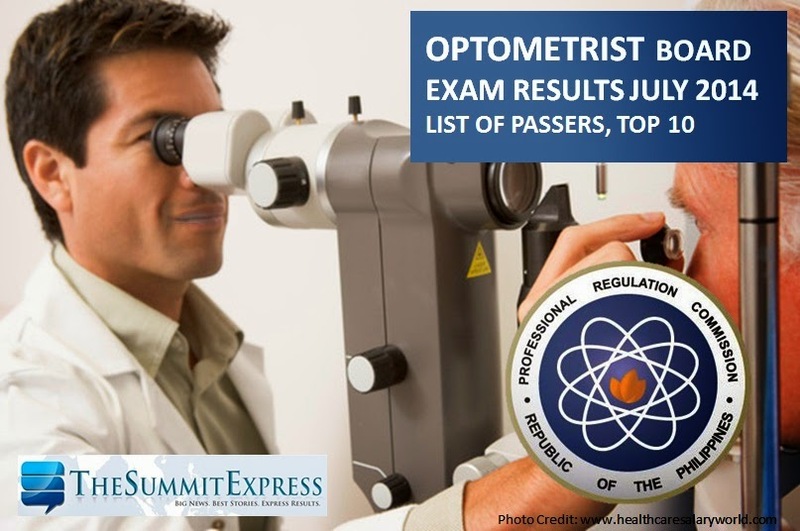 The Professional Regulation Commission (PRC) and the Board of Optometry released results of July 2014 Optometrist board exam in 2 working days after the exam. The full list of passers, top 10 (topnotchers), top performing and performance of schools are available on this webpage as now out online. PRC on Friday, July 18, 2014 announces that 111 out of 118 passed the Optometrist Licensure Examination. PRC announces that 9 out of 12 examinees passed the Special Certification Examination in Ocular Pharmacology for Optometrists . The Optometrists board written examination was administered in Manila on July 8, 9, and 10 while the practical phase was scheduled on July 14, 15 and 16, 2014. Optometry board exam covers the following subjects: ocular Pharmacology, ocular diseases, ethics, primary care, practical, theoretical optics and opthalmic dispensing, physiological optics, visual biology and binocular vision (Written Phase). The Practical Phase includes objective examination, subjective examination, opthalmic lens laboratory and contact lens practice. In December 2013, PRC announced results in 2 working days. PRC named a total of 82 out of 96 who passed the Optometrist Licensure Examination. Like Us on Facebook or Follow Us on Twitter to receive more updates. You may also subscribe to our RSS Feeds via E-Mail.